Philippe Diaz from the University of Montana won the “Shark Tank: Making your Pitch: What do investigators/partners look for when evaluating a University-based technology?” at the Society for Investigative Dermatology Annual Meeting on April 26. This is one of the largest meetings for dermatological research with more than 1,500 attendees and more than 1,000 posters. Philippe had five minutes to pitch their technology/company and five minutes to address the panel comments. 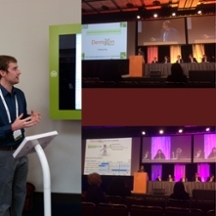 The poster was presented by Philippe’s graduate student, Joachim Veit on April 27 and has been selected for an e-poster presentation and three minute elevator pitch. Go Griz!